From Evgeni Plushenko’s back problems to daily crashes on the ski and snowboarding courses, doctors had their hands full at the Sochi Games. A trauma surgeon who worked at the event reflects on the experience. 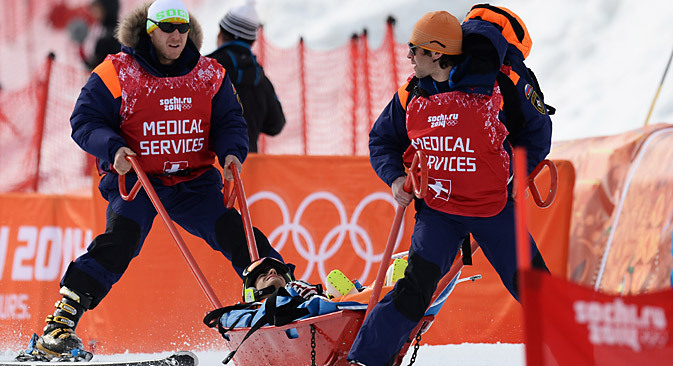 Dr. Oleg Milenin, a trauma surgeon and a senior medical specialist who worked at the Sochi 2014 Winter Olympic Games gives his impressions of the medical support system in Sochi. I'll be honest: doctors had their hands full at the Sochi Games. There were a lot of joint injuries, including cases of torn anterior cruciform ligament (ACL) in the knee. For example, an alpine skier from Kazakhstan suffered such an injury during the Games. What can be done in such cases? The athlete is taken to our clinic on an electric ambulance car (we have two of them here). They undergo a CAT scan, and then doctors use a needle to remove blood and fluid from the knee joint. Oleg Milenin, 40, is an orthopedic surgeon and trauma specialist who specializes in athletes’ injuries. He was a doctor for the Russian Olympic Team at the 2008 Beijing Games and the chief sports traumatology specialist of the Sochi Games organization committee. In 2013, he performed 930 operations, including 800 arthroscopic procedures. All the athletes taking part in the Sochi Games are insured, so even the most expensive manipulations and surgeries aren't a problem financially. The athlete from Kazakhstan with the knee injury will have surgery in a Moscow clinic in another five or six weeks. Why such a long wait before the operation? Because for best effect, the swelling of the joint should subside before surgeons intervene. Unfortunately, in this particular patient, the torn cruciform ligament is never going to heal itself, so we are going to have to replace it. It’s a very high-tech procedure, which requires an experienced surgeon who specializes in arthroscopic procedures. The new ligament that will replace the torn one will be made out of the patient’s own ligament tissue. Six months after the operation, it will perform just like the original ligament, and the athlete will be able to start training again, albeit gradually. We saw many patients during the Games, but Americans always stood out from the crowd. You see, they never walk alone. Every American athlete who came to receive some medical assistance was always accompanied by three doctors from the U.S. team, several security people, and several other people. You could easily have 10 people in total. The Americans always carry their own drinking water. They never touch anything, and they wipe every surface they touch with alcohol. You are not allowed to take pictures of them, and you can't touch them, either. There is a strict No Needles rule at the Olympics. An athlete can be disqualified by the doping commission if a needle mark from an injection is found on their body. A doping commissioner can walk into an athlete's room any time of the day or night. Of course, a doctor is allowed to make an injection in case of a real emergency. But lots of forms will have to be filled after that, and it must be clearly explained what kind of drug was injected, and why it was necessary. So by and large, injections are reserved for real emergencies; athletes prefer to suffer a bit of pain rather than risk an injection. This interview has been abridged from the original. First published in Russian in Gazeta.ru.